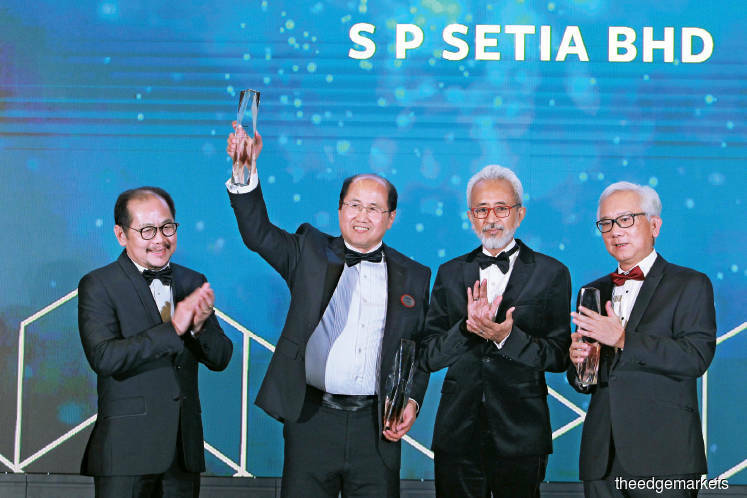 KUALA LUMPUR: S P Setia Bhd has clinched the top spot in The Edge Malaysia Top Property Developers Awards (TPDA) 2018. This is also the third consecutive year the company has won the spot. S P Setia president and chief executive officer (CEO), Datuk Khor Chap Jen, said the company is proud to retain the No 1 spot, which is also its 11th time overall. “I would like to attribute this win to the strong and continuous support received from Team Setia. Teamwork is definitely the hallmark of our success,” he added. S P Setia is also the winner for both the Best in Quantitative Attributes and the Best in Qualitative Attributes sub-awards. The group shares the Best in Quantitative Attributes with UOA Development Bhd (No 4). The TPDA anchors The Edge Malaysia Property Excellence Awards (TEPEA), which in recent years has expanded to include other sub-awards such as The Edge-PEPS Value Creation Excellence Award, The Edge-PAM Green Excellence Award, The Edge Malaysia Affordable Urban Housing Excellence Award, The Edge Malaysia Outstanding Property CEO Award and The Edge Malaysia Pioneer Development Award. The other top 10 winners are IJM Land Bhd (No 2), Sime Darby Property Bhd (No 3), Sunway Bhd — property division (No 5), Eco World Development Group Bhd (No 6), IOI Properties Group Bhd (No 6), Mah Sing Group Bhd (No 7), UEM Sunrise Bhd (No 7), Gamuda Bhd — property division (No 8), Tropicana Corp Bhd (No 9) and Eastern & Oriental Bhd (No 10). Eco World Development and IOI Properties share rank at No 6, while Mah Sing and UEM Sunrise share rank at No 7. The TEPEA gala dinner was held yesterday at the Hilton Kuala Lumpur, with more than 400 real estate players and experts coming together to celebrate the event. “For the Top Property Developers Awards we have both qualitative and quantitative evaluation,” The Edge Media Group publisher and group CEO Ho Kay Tat said in his speech. “The qualitative evaluation is done by a panel of judges who are industry personalities. The companies are judged by their peers, which is probably the most satisfying way to be recognised. To mitigate the risk of biasness, judges abstain from casting their scores for companies where they are conflicted,” he said. The scores and rankings for the TPDA are audited by Deloitte Malaysia. Also attended the event were Deputy Housing and Local Government Minister Datuk Raja Kamarul Bahrin Shah Raja Ahmad Shah and The Edge Media Group chairman Datuk Tong Kooi Ong. In his speech, Raja Kamarul Bahrin Shah noted that both the government and the private sector, including developers and financiers, have a collective responsibility to help Malaysians, especially young Malaysians, own a home. “We must strive to facilitate homeownership especially among first-time house buyers,” he added. This year, The Edge Malaysia Lifetime Property Achievement Award is awarded to Bandar Utama City Centre Sdn Bhd’s Tan Sri Teo Chiang Kok. The award recognises his contribution to the development of Bandar Utama in Petaling Jaya. Meanwhile, The Edge Malaysia Outstanding Property CEO Award goes to MKH Bhd’s Tan Sri Eddy Chen and UEM Sunrise’s Anwar Syahrin Abdul Ajib. The award recognises CEOs and professionals whose leadership has taken their companies to extraordinary heights. The Edge Malaysia Pioneer Development Award — to recognise significant projects that have not only emerged as a pioneer in the market but also contributed positively to the growth of its surrounding areas — goes to Sunway Bhd and Ramsay Sime Darby Health Care Sdn Bhd for their hospital projects. The Edge-PEPS Value Creation Excellence Award — started in partnership by The Edge and the Association of Valuers, Property Managers, Estate Agents and Property Consultants in the Private Sector — recognises developments that have provided outstanding rewards to their purchasers in terms of capital appreciation. This year’s winner is Horizon Hills Development Sdn Bhd’s Phase 2D3 in Horizon Hills, Johor, while the merit award goes to Mah Sing’s Alpine @ M Residence 2 in Rawang, Selangor. In partnership with the Malaysian Institute of Architects, The Edge-PAM Green Excellence Award recognises projects that demonstrate sustainable design innovation while contributing positively to the community. The winner is EPIC, the Environment Preservation and Innovation Centre in Negeri Sembilan by Kualiti Alam Sdn Bhd, while the honorary mention award is given to Franky Land Sdn Bhd for Mangala Resort & Spa in Pahang and S P Setia for Setia Spice in Penang. The Edge Malaysia Affordable Urban Housing Excellence Award, which honours affordable housing projects for the urban middle-income group undertaken wholly by Malaysian private developers, is awarded to Savanna Executive Suites @ Southville City in Selangor by Mah Sing. The TEPEA this year is sponsored by Auto Bavaria and USG Boral, and presented by City & Country, the property pull-out of The Edge Malaysia weekly. It is supported by EdgeProp.my. The full coverage of the TEPEA will be published in a special report in the Nov 5, 2018 issue of City & Country, The Edge Malaysia weekly.